The latest issue of Pike & Predators is out now! * NEVILLE FICKLING's PREDATORIAL - WHAT’S THE FORM? Everyone has heard of the term ‘form’ as applied to various sportsmen. Does it also apply to fishing for predators? Neville Fickling believes it does. 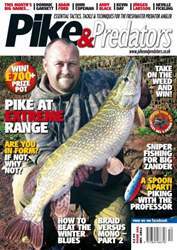 With the advent of good pike fishing from the banks of some of our trout reservoirs, extreme range pike fishing has now become de rigueur. Andy explains how it’s done. John concludes his look at the relative advantages and disadvantages of braid and mono. Jörgen Larsson describes an advanced approach to vertical jigging for big zander in midwater. A lure with a PhD in pike, the Kuusamo Professor is something of a spoon apart. Dominic made it to far flung Lapland to discover first hand just what makes these Finnish lures so unique. Bertrand looks at bank fishing tactics on rivers for cold-water perch using soft plastic baits. Kev is an admirer of carp anglers – or at least carp anglers’ rigs and terminal tackle – and his zander rigs have benefi tted from it. Have your say in our lively letters pages.